Japan is a country famous for many things: the sleek and efficient bullet train; traditional culture; world-famous cuisine and perhaps, most endearing of all, the snow monkey. It is the small town of Yudanaka that many of these wonderful animals have made their home. 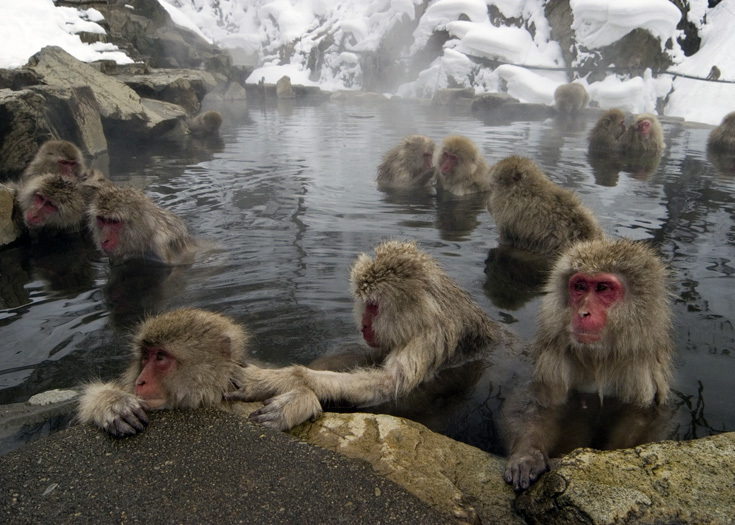 Situated deep in the Japanese Alps, in an area known as “Hell Valley” thanks to its hot steam vents, sulfurous streams and other volcanic activity, the snow monkeys can be found taking advantage of their surroundings by bathing in the hot spring baths dotted throughout the area. Indeed, the monkeys have acquired such a reputation that one of these baths has been declared a ‘human-free’ zone and is used exclusively by the monkeys! Japanese macaques, to call them by their proper name, bathe all year round, but it is especially amusing to watch them during the winter months, when the area is covered in a thick, white blanket of snow, which sits adorably on their heads as they attempt to warm up in a very human-like fashion. Though the animals are still wild, they have become somewhat use to the attention they now receive and photo opportunities abound as groups huddle together against the freezing air temperatures, preen each other and play. Hundreds of monkeys at a time can frequently be seen enjoying the warn and healing waters here. The journey into the heart of Nagano isn't the easiest for visitors – after riding the bullet train from Tokyo for one and a half hours you then embark on a 40-minute train ride from Nagano City. A pleasant walk through beautiful woodland completes your journey. The sight that awaits you is well worth the effort though and as the area is dotted with hot spring inns, you can follow the monkeys’ lead and soothe away the day’s travels in the natural thermal waters. This guest post and images have come from Audley Travel, an award–winning tour operator, specialising in tailor-made trips and small group tours for the discerning traveller, to over 80 countries around the world. 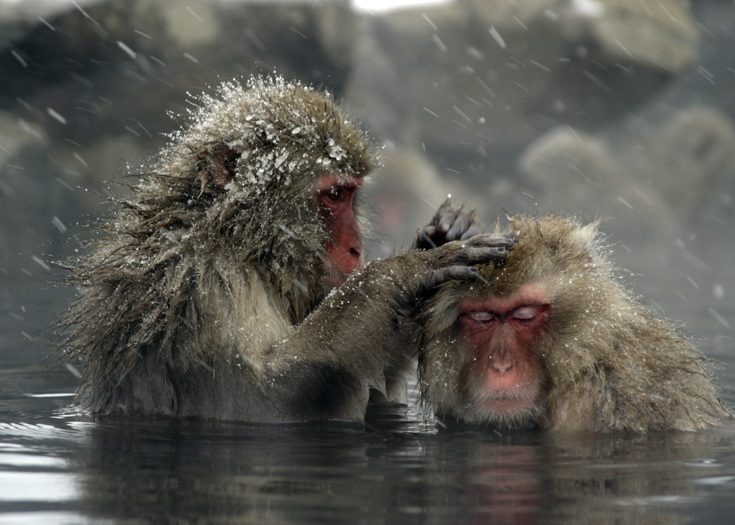 I REALLY want to see the snow monkeys! I went there a few winters ago. Thanks ZJ, Definitely a must have experience in Japan. Did you do a day trip or stayed overnight? These monkeys remind me of Peter Cushing. Amazing animals. Thanks for hooking up with Audley Travel to bring this to us. Thanks Rowwdy, Yeah, definitely winter is the time to see these guys :) Maybe next trip? Thanks Ru, Totally agree with you. Have you had the chance to visit these cute creatures before? Adorable!! There little red faces from the heat of the onsen, very cute!! Seems like totally worth traveling and the hike through the woodlands sounds good too actually!